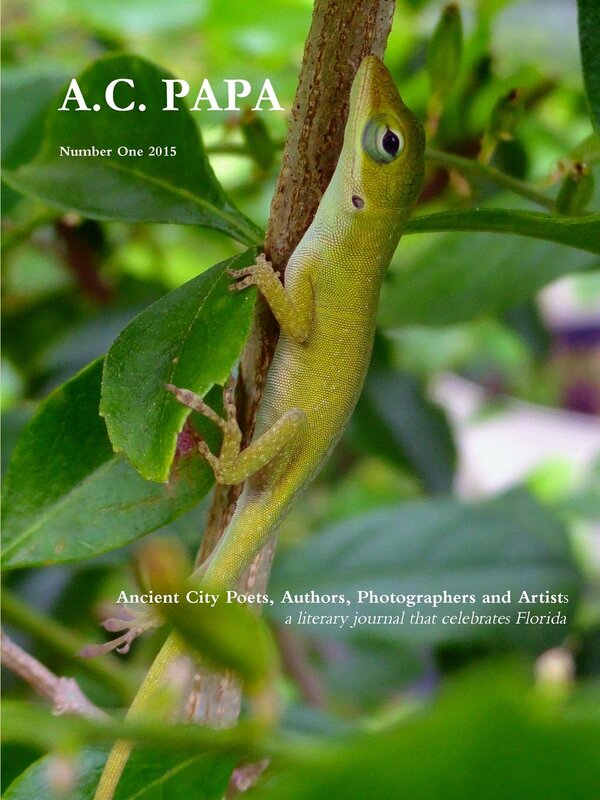 In case you missed it earlier this year, “a literary journal that celebrates Florida,” A. C. PAPA (Ancient City Poets, Authors, Photographers and Artists), an 8-1/2″ x 11″ glossy-cover anthology was released by Editor-In-Chief Chris Bodor of the Poet Plant Press. This is Mr. Bodor’s seventh and most stunning publication to date. The front cover features an up-close photo by Mark Kirwan of a Florida green anole, in honor of Florida’s very own Jim Morrison (1943-1971), born in Melbourne, Brevard County and oftentimes referred to as The Lizard King. The back cover lists all the talented contributors in alphabetical order. This book sits beautifully on my coffee table. Its appearance is too engaging to allow it to become lost and hidden between other books on a bookshelf. Between the cover of this 145-page book, the reader will find poetry including haiku, essays and articles, fiction, photography and photos of other medians of artwork and book reviews, all Florida-themed. Charlie Cawley’s photo “Scene in Saint Petersburg” depicting a “Store of the Future” is priceless. Pris Campbell’s poem “The Silence of Memory” begins: “Your car rumbles down the coast, / headlights searching the Daytona / skyline for your other life.” This opening stanza, to me, is a poem in itself. I feel it portrays a universal theme of revisiting old territory and the bittersweet feelings stirred by its memories that momentarily almost genuinely relive themselves. The Ancient City Poets meet the last Sunday of each month for an open mic session in historic St. Augustine, FL.